Can spoiler Mark Begich become savior in Alaska? 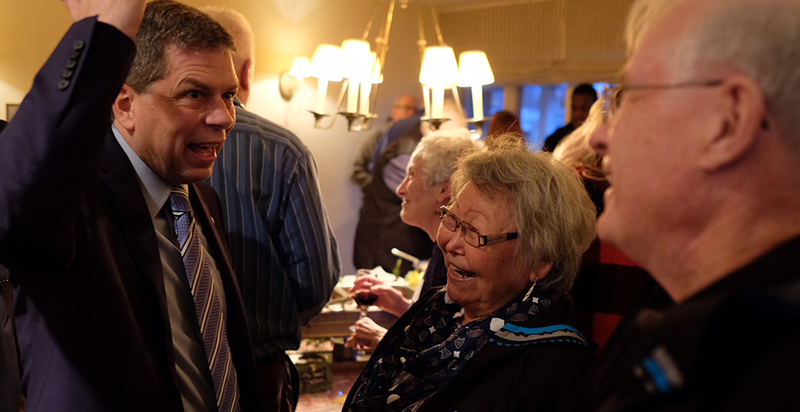 ANCHORAGE, Alaska — Democrat Mark Begich was in his element last week during a fundraiser at the home of former Alaska Gov. Tony Knowles (D). In a living room packed with cheering supporters, Knowles described Begich as the "right choice" for governor. "Together with a highly qualified running mate, Debra Call, they will boldly and successfully face the momentous challenges of our times. This is their, this is our, this is Alaska's moment," Knowles said, gesturing to a beaming Begich. On cue, Begich stepped forward to slam his Republican opponent, Mike Dunleavy, for dismissing climate change, supporting school vouchers and voting to cut health care programs during Dunleavy's stint in the state Senate. Begich also praised Alaska Gov. Bill Walker (I) for dropping out of the governor's race after Walker's running mate, Lt. Gov. Byron Mallott (D), resigned and withdrew from the campaign. In ending his bid for re-election, Walker threw his support behind Begich (Energywire, Oct. 22). Only four months earlier, Begich, 54, had been denounced as a spoiler who would thwart Walker's bid for re-election. Walker supporters and some Democrats warned that by jumping into the race, Begich would split the state's moderate and liberal voters with Walker, allowing the conservative Dunleavy to win the election. A group of Democrats even posted a petition on MoveOn.org asking Begich to drop out. Begich stood firm, but early October polls showed that his critics were right. Dunleavy had a 17-point lead over both Walker and Begich. All that changed Oct. 16, when Mallott resigned after he admitted to making "inappropriate comments" to an unnamed woman. In the political storm that quickly followed, Walker ended his campaign, and Begich went from spoiler to potential savior for the state's moderates and liberals. At his fundraiser, Begich noted that during the 48 hours following Walker's withdrawal, over $100,000 in political contributions flowed into his campaign. An Alaska political opinion poll taken after Walker left the race showed Begich within 4.7 points of Dunleavy. But as Election Day draws near, Dunleavy has a much fatter bankroll to draw on than Begich. As of early October, before Walker dropped out of the race, the Dunleavy election campaign and two pro-Dunleavy super political action committees reported combined contributions of nearly $4 million. Most of that money came from the Republican Governors Association. At the same time, the Begich camp and an independent expenditure campaign supporting him had a combined total under $600,000. During the last reporting period, from Oct. 6 to Saturday, the Begich campaign raised $334,433. Yesterday, a group called Defeat Dunleavy reported spending almost $500,000 on television ads against Dunleavy's candidacy. Alaska Public Media reporter Nathaniel Herz noted that the group has ties to the Democratic Governors Association. In addition, during the 10 days after Walker dropped out of the race, the independent expenditure campaign Begich for Alaska raised more than $130,000, including $2,500 each from actors Ted Danson and Samuel Waterston. On Saturday afternoon, Dunleavy made a stop at the Lions Club hall in Eagle River for yet another political rally in his nearly yearlong campaign for Alaska governor. Among the speakers introducing Dunleavy was Michael Tavoliero, a local Republican Party leader, who painted a dark picture of the dangers of Begich's liberal politics. "We have never faced an adversary more bent on destroying our constitutional republic in our lifetime," Tavoliero said. He added that the political left is seeking "to bankrupt us [and] destroy the futures of our progeny." In his speech to the crowd, Dunleavy described Begich as "a polished politician" who wants to "turn Alaska into Portlandia or Seattle or the left coast." The 6-foot-7 Dunleavy, 57, is running on the campaign slogan "Standing Tall for Alaskans." At the rally, he made fun of Begich's shorter stance, as well as the Democrat's campaign positions. "Sometimes Mark is like a rice cake," Dunleavy said. "Looks good. Sometimes it tastes good. But there's really nothing to it." Calling for supporters to help get out the vote, Dunleavy predicted that the Nov. 6 election will be "a turning point in the history of Alaska where we rejected the policies of the far left on the issues of environmentalism and we raised the policies of pro-growth, pro-jobs and capitalism." During the last week, the Alaska governor race has shifted into a tight, tense head-to-head battle between Begich and Dunleavy, with each candidate accusing the other of backing extremist policies. Clear differences do exist between the two. On the environmental front, Begich supports Alaska's salmon ballot initiative that would impose strict new permitting regulations for developing projects near salmon habitat. Dunleavy strongly opposes it. Begich is promising to curb Alaska's greenhouse gas emissions and create a Cabinet-level team to vet climate change proposals. However, he opposes a carbon tax. Dunleavy acknowledges that coastal Alaska is being affected by rising temperatures. But he opposes steps to cut the state's carbon emissions and vows to eliminate Walker's climate change team. Dunleavy invariably turns the climate conversation toward the benefits that Alaska will enjoy as the increasingly ice-free Arctic waters attract shipping and resource development companies to the state. Begich backs Walker's proposal to have the state build a $44 billion natural gas pipeline and liquefied natural gas export facility. Dunleavy wants the state's major oil producers, BP Alaska, ConocoPhillips Alaska Inc. and Exxon Mobil Corp., to take charge of the project. The companies had been partnering with the state on the project until they bowed out early last year. Both candidates would take steps to preserve Alaska's popular Permanent Fund Dividend (PFD) program, which is drawn from the earnings of the oil-backed Permanent Fund savings account. Over the last three years, Walker cut the annual dividend for Alaska residents and used the money to help pay for state programs. Begich supports a state constitutional amendment guaranteeing residents a dividend check and limiting the amount of PFD money available to pay for state programs. He also advocates using some of the earnings to pay for public education programs. Dunleavy is promising to pay full dividends and reimburse Alaskans who received reduced dividend payments over the past three years under the Walker administration. As the Alaska gubernatorial race winds to a close, both candidates have been spreading the news about their latest endorsements. 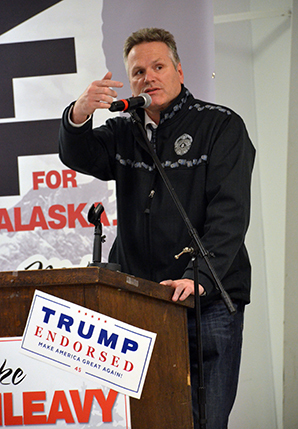 During the past two weeks, Dunleavy was endorsed by Alaska's all-Republican congressional delegation, Sens. Lisa Murkowski and Dan Sullivan and Rep. Don Young. Last Thursday, Dunleavy won a prized endorsement from President Trump via Twitter. But minutes after Trump's announcement, the Grammy-winning rock group Portugal. The Man, which has roots in Wasilla and a huge following in the state, posted a tweet of its own, this one endorsing Begich. As a result, Alaska news reports about Trump's endorsement gave equal time to the Portugal. The Man tweet. More recently, Begich was backed by former Democratic presidential candidate Hillary Clinton. Despite Clinton's endorsement, Begich dismisses the Republicans' claims that he is an extreme liberal at heart. In an interview after his fundraiser, Begich paused to summarize his political philosophy. "I have been what I consider to be an Alaska Democrat who cares about the environment, women's right to choose, reproductive rights," he said, "but also believes in building a good economy, with a small-business backbone. Making sure we have a good resource development, but making it a balanced approach. "Now that ain't liberal and that ain't conservative, that's hard and true Alaskan."